Coloccini: We haven't been tested yet | NUFC Blog. Sideshow Bob: It won't all be plain sailing. After Newcastle United’s very good start to the current season, which sees them in the top four after seven games, the clubs captain, Fabricio Coloccini, has joined manager, Alan Pardew, in sounding a note of caution. “The team spirit is different to last season. When you start well everything is good, everyone is happy. It’s different. We’ll find out more when we have some bad times. A sterner test may come when the Magpies face Tottenham Hotspur, who have looking threatening since getting over a dissapointing start in the Premier League, which saw them fall to bad defeats against Manchester’s United and City. They have won all of their Premier League games since including a comprehensive 4-0 demolition of Liverpool. Another sticky patch may come when the Magpie’s face a terrible trio of games against Manchester City, Manchester United and Chelsea in succession from the 19th November onwards. Meanwhile, the Newcastle United captain was noncommittal on looming contract negotiations, with the Collocini’s contract set to expire in June 2013, and current owner, Mike Ashley, seeking to purge older, more highly renumerated players from the club, it is thought that he may only be offered a much reduced salary package to his currently estimated £80,000 per week. If this was the case, Coloccini may prefer to run down his existing contract in the hope of reaping the financial benefits of being a free agent, or the club may feel forced into selling the player while they could recoup at least some of the £10.3 million paid to Deportivo La Coruña in 2008. But I digress. However Gutierrez is on a lower wage than his captain and compatriot, so time will tell. Two of the reasons why Newcastle United can be great again! 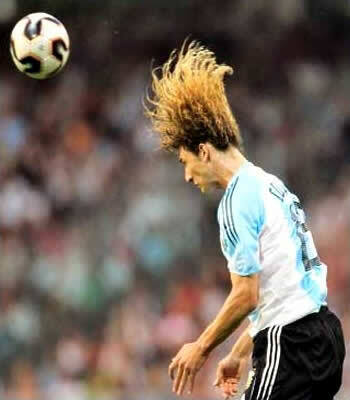 That’s some serious hair he has. If anyone deserves 80k surely Capt Colo does right. Top class if you ask me. Joe, Ashley dfinitely seems to have changed his ways since he paid £10.3 million (after a wrangle with Deportivo over the price) and gave him his original £80,000 per week contract. Even at the age he was when he joined the club, Colo would also seem to be a little old according to Newcastle’s current policy, with the emphasis on younger, cheeper players who can be sold on at a profit. I wouldnt swap our central defence or central midfield for any other partnerships in any PL team,and Colo is the best ball playing centre-back we have had since Phillipe Albert ! @Worky …. I’ve long given up trying to understand what goes on in Ashley’s mind but it does seem as u say that he’s changed the policy since those days. But I’ve noticed also that neither Carrol, Nolan, Barton or even Enrique complained much about the wages being offered. They were just against the length of the contract except for Enrique who wanted champs league (which is why he went to liverpool uh wait what???). I dunno, have a feeling we’re paying average wages in premiership which is definitely higher than other mid table teams in other leagues. If we offer decent wage with a 2 year extension I think Colo might sign. I hope he will. Look at Sports Direct and the brands he purchases and you may get some clues Joe. We must have some experienced players, that means they’re ‘older’ usually. But older players that are either gobshites, not up to it, or not up for it, get rid, every time, all day long.